This is a very easy recipe (as most salads are). The only cooking involved here is for the quinoa and if you're always in a hurry you can always cook your quinoa ahead (they're usually last for 2-3 days in the fridge). Just make sure you store them using a tightly sealed container. I'm no Quinoa expert but the way I cook it is 2 parts water for 1 part Quinoa (2:1). And I usually just let it boil till the water evaporates (just like how you would cook rice). This is the guide I used when I cooked my first batch and I stuck to it because it yielded just the right way I'd like my Quinoa to be. To be honest, I'm still in the process of discovering and trying out everything I read to be a healthier and better for my body. I'm lucky to always stumble on tasty recipes though and I don't think I'm giving up anytime soon on this experimentation. This was the lunch I packed for work yesterday and I shared it with my co-workers who loved it! I have yet to really incorporate this pseudo grain into my daily meal plan but I usually try to prepare something 2 to 3 times a week. The past few weeks, I did my recipes during the weekends because that's when we buy our groceries and that's also when my ingredients are the freshest. But this week, I got a little lazy and went to eat mostly what was prepared by our helper. 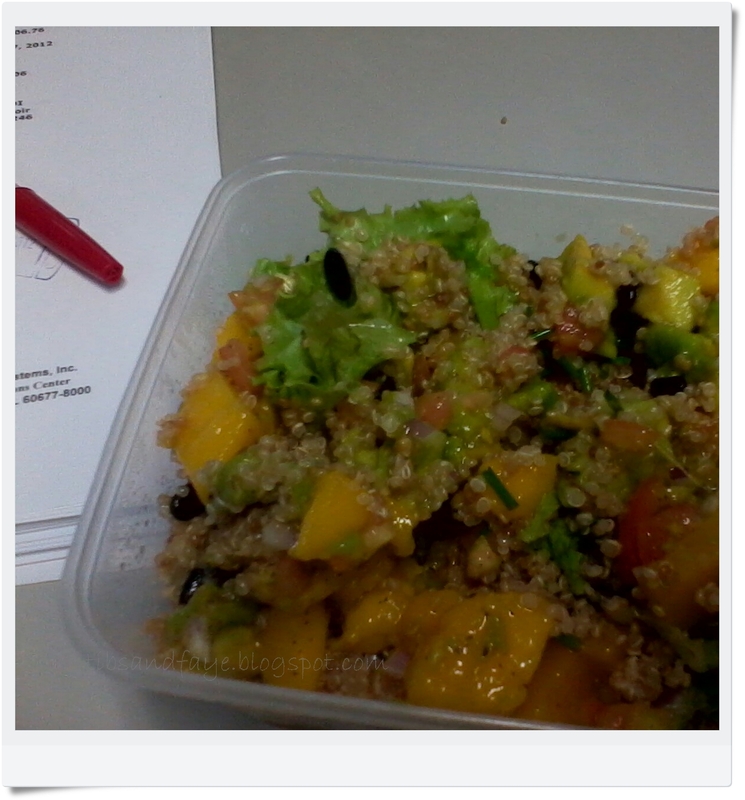 Come mid-week however, I rushed to prepare some Quinoa because I was looking for other ways to use the fruits and greens that have been sitting in the fridge for a few days already. So this recipe I'm sharing is sort of a throw-in-everything-in-there kind of thing (hehehe) because I pretty much used what's in our fridge. Toss everything in a salad bowl and drizzle with dressing. If you have some cashew nuts on hand, chop them up and garnish as well. The nutty flavor would definitely compliment all the sweet and tangy flavors in this salad. **Quinoa is very low in Cholesterol and Sodium. It is also a good source of Magnesium and Phosphorus, and a very good source of Manganese.